Nextiva consistently wins industry awards for its cloud based business VoIP phone systems. Thousands of small and medium sized businesses across the United States choose Nextiva Office as their comprehensive phone service. Nextiva customers can choose between a wide range of communications services such as Hosted PBX, Online Fax and SIP Trunking, to name a few. Every service offered by Nextiva is backed by their award winning Amazing Support. Great products and excellent service are exactly why Nextiva has doubled its customers in the last year. Their premiere product provides an affordable yet powerful office phone system for small and midsize businesses. Critical business features like online fax, advanced routing to any other phone and dial-by-name directory searching are standard. Access all your service and usage information from wherever you happen to be, through Nextiva’s easy to use online portal. Businesses which have a PBX system already installed can upgrade to Nextiva’s SIP Trunking service. SIP Trunking allows your business to take advantage of the latest real-time communications technology including business VoIP, video and data, without having to replace your current PBX system. SIP customers can add trunks as their business needs grow, keeping costs under control while keeping all their options open. Tailored for the mobile professional, the Connect virtual phone system lets you route your calls to any other phone any time you need to be somewhere else. It comes with a simple to understand, intuitive control panel you can access online. Set up directories, virtual mailboxes and re-route your calls. As an affordable and easy-to-use online fax service, Nextiva vFAX really stands out. All you need to use it is an internet connection. Fax from your email program, from within Microsoft Office, or the online vFax control panel. Fax from your cell phone or, just to be cute, fax from your fax machine. Nextiva vFAX does that, too. Small to medium sized businesses need to control communications costs while improving and increasing their options. Installing the Nextiva office phone system can save as much as 80% over traditional phone systems. The Nextiva website has an incredibly comprehensive support section. They say they are fanatical about great customer support and they mean it. If the website doesn’t have the answer you need, there is always a real person who can take care of whatever you need. Nextiva phone service has been excellent and comes with more benefits than we could ask for. While there are a handful of companies out there that provide good phone service, I think it is the Nextiva customer service that was really the big seller for us and what makes us feel so confident with our phone service. Not only do real people answer the phone right away, but they are so friendly and helpful and genuinely want to make sure you are happy with the service and that everything is at the level you want it to be. It has always been said that employees make a business and with this company it really holds true! Those support reps are well trained and are awesome! Very comforting to know you have them there whenever you need. A this point I really disapointed. They have lost papers, delayed a porting due to these lost papers. Turns out they had everything they needed from the beginning, suprise. Then time for the porting comes around and they can’t set up the system like I requested 2 months ago and tell me there will be additional charges to get it set up like that. So at this point I’ve paid for 2 months of service (over $400.00) and still do not have service. Quite a racket they have going if you ask me, take your money and act like everything’s going fine for a month or so, take a second payment then tell you sorry, we are going to need more money. We have been with nextiva for over 8 years, no matter what other people tell you their customer service and support is the worse i have ever experience, they are rude and not professional and never resolve any issues what so ever….but only ask you more and more questions in an effort to exhaust you. call quality is good yet more than a few calls do not make it to the end destination (only about 80% of the time it works). when comes to the registering a phone over the pbx, there is always a delay when talking which makes it useless. the only good 2 features, which are must common to ever provider and are basic, call forwarding and auto attended, but what kind of a provider would you be without these basic feature…..all in all, we are not satisfied with there service and cannot and would not recommend them. I use their phone, fax and call answering tools for the office. Benefits have been no more phone bills, and a more reliable service. It has reduced large overhead costs from the local phone company. Love our cool auto attendant! Voice to email has been an unexpected bonus that has improved my company’s efficiency. So many VOIP services but none have compared to the price and quality i received from Nextiva. If your system is set up properly, you will have a cost-effective, reliable and great alternative to your expensive landline. If you need a phone that you can plug in and have a rep hold your hand through the process, this is the company for you. Be patient because once it is set up, you will have a wonderful service with awesome features. Nextiva’s online support is also fast and the reps are thorough in their answers, no canned responses; these guys actually give you answers that help you. I am the owner of a small business, with locations in various parts of the U.S. and two in Canada. I needed all my locations to have the same toll free number, with different extensions. I tried getting this from another VoIP provider and it was a disaster. We used their service and phones for 12 days, but phones were only actually operable for a few hours in those almost 2 weeks. Nextiva offers a full service solution for business in the most cost effective packages. Their features are second to none. We would never use another service for our business phones again. Their customer service is wonderful. We experienced an issue with one of the phones in one of the satellite offices and the Nextiva tech support walked my employee through every step to restart and plug everything back in to get the correct IP address. It all took maybe forty-five minutes and the phone was back up and running. I’m extremely pleased that I made the decision to go with Nextiva. 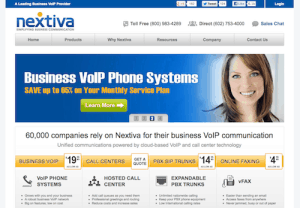 Nextiva is hands-down the best VoIP company on the market. When I started my business, I needed to be able to record calls and all the other companies just charged too much. I didn’t even know that I could access real-time call records and direct my calls to other numbers. I can’t tell you how many times I’ve needed to use those services, which are all included in an affordable package with Nextiva. The call quality is also great on Nextiva and if you have any issues, they are quick to sort it out. The tech support is really spot on – helpful, friendly and efficient. If you have issues, they will take time to understand exactly what is wrong and they are always courteous. I will definitely stick with Nextiva, even if another company offers the same service for cheaper, simply because I know and trust Nextiva. Having been a Nextiva customer now for over a year, I came to this website from Google and wanted to share some feedback regarding my experience with Nextiva. The simplicity of the service combined with the price makes it tough to beat. I’m sure prices for phones and service will go down over time but considering how Comcast wanted to charge me $65 per month per line and I’m no paying $20 per line and getting more features, Nextiva really is a no brainer. They get my full recommendation.